Condition:Green cloth-bound softcover with title to spine and front cover, STRAIGHT, TIGHT and CLEAN in GOOD CONDITION with inscription in pen to front paste-down opposite the unusual thick card frontispiece plate, resembling a cover (?perhaps glued-in, see scan). Description: HANDWRITTEN DEDICATION : "This book is the property of Frank Astey, please friend do not take it away". (18 August 1865 – 31 October 1940), Australian politician, served 38 years as a Labor member of the Victorian and Commonwealth parliaments. Author: Angus Mackay FCS Instructor in Agriculture, Technical College, N.S.Wales. Medallist for Chemistry and for Australian Grasses, Author. Condition:Black cloth-bound hardcover with gilt title to spine which has been knocked at the crown, leaving 1 1/2" (4 cm) section chipped from the spine, otherwise STRAIGHT, TIGHT and CLEAN in GOOD CONDITION with initials in pen to titlepp. and preface page. 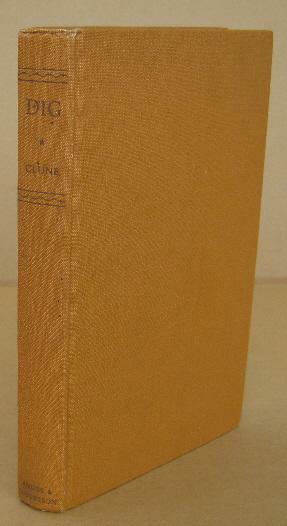 Publisher: Angus and Robertson, Sydney, 1958, FIRST EDITION hardcover 8vo with dj, 245pp. Description: As in previous novels, this one abounds in varied and fascinating characters. We find the great historical figures of those early days in South Australia, both in colonization and exploration, the influx of the German settlers and their influence. Publisher: Angus & Robertson, Sydney, 1949, First Edition, 172pp., hardcover 8vo without dj, 39 chapters, b/w photo illustration plates. Coloured maps to endpapers. Frontisp. Condition:Worn and marked (see scan) but intact cloth-bound hardcover with title to spine which is bumped at the crown, STRAIGHT and TIGHT in GOOD MINUS CONDITION with a photo of Idriess glued to the 1/2 title-page, without dustjacket and with a marked cover. Description: First Edition of Idriess' book describing the lives of the men who gather in the Kimberley every year at the tiny port of Derby, WA. There they remain isolated during the Wet Season. Written and photographed in 1934 as a series of "fragments" of lives. Publisher: Murray, Sydney, 1977, FIRST EDITION, 128 pp., large softcover 8vo, 12 chapters, illustrations are b/w photos, World Speed Records, Appends., Notes, an appreciation. Condition:Softcover with title to spine, a few chips to edges of cover, STRAIGHT, TIGHT and CLEAN in GOOD CONDITION with a name in pen to the 1/2 title page. 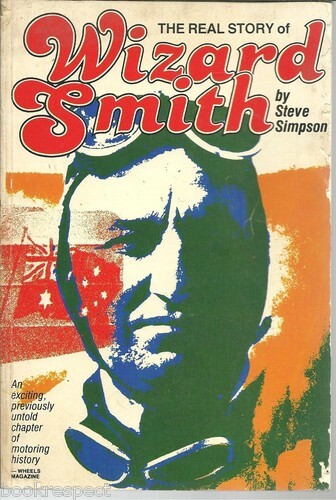 Description: The Real Story of WIZARD SMITH An exciting, previously untold chapter of Motoring History Written by Simpson, who intervued Smith before his death in 1958. A fascinating biography of the man who persued the Wakefield Trophy in the 1930s. 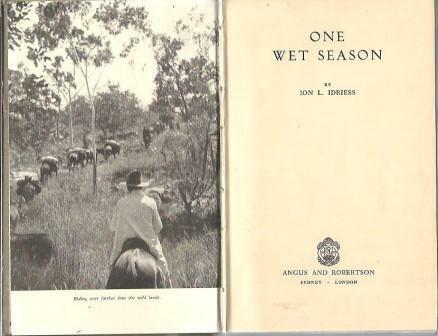 Publisher: Angus and Robertson, Sydney, 1953, 1st of this edition, originally published in London in 1896, hardcover large 8vo without dj, 237pp., B/W and one colour ILLUST. Condition:Brown Half leather (spine & corners) with textured cloth-bound hardcover with gilt title to spine, slight rubbing to spine & corners, no inscriptions, CLEAN & TIGHT in GOOD CONDITION, yellow to outside page edges, foxing to eprs and to page edges, no dj. Description: These important legends were collected by Mrs Langloh Parker more than 100 years ago, from the aborigines that she grew up with on her father's station, and on her own station when she was married. Some of the stories are "woggi-gai", or fairy-tales. Title: DIG. A Drama of Central Australia. (The Story of Burke and Wills). Publisher: Sydney, Angus and Robertson, 1951, Hardcover, 241p. New Illustrated Edition. Ochre cloth, frontispiece portrait, black & white illustrations, endpaper map. Description: The complete story of the historical Burke and Wills expedition through Central Australia. 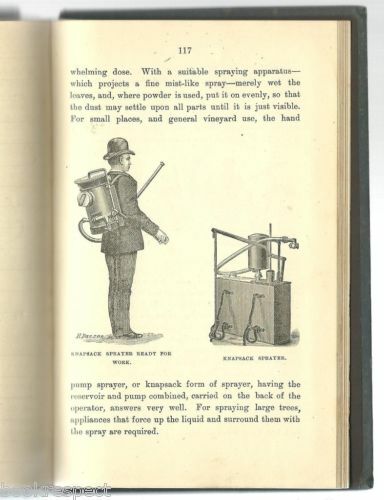 Illustrated with b&w photographs. 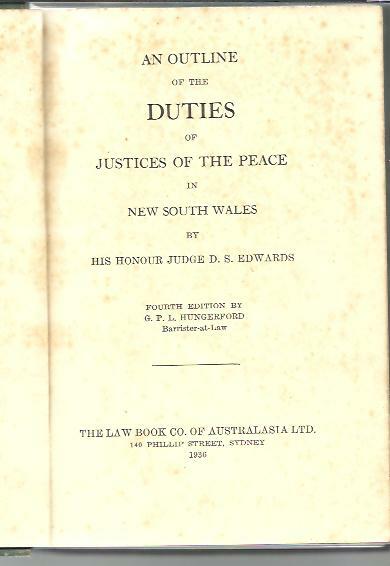 Title: An Outline of the Duties of Justices of the Peace in New South Wales. Author: His Honour Judge D.S.Edwards. $th Edition by G P L Hungerford, Barrister at Law. Condition:Green cloth-bound hardcover with blindstamped title to frcover and faded gilt to spine,Fox-spots to prelims and to pp. edges, STRAIGHT & TIGHT in GOOD MINUS CONDITION without inscriptions and without a dj. Description: With some alterations following upon amendments to the Justices Act, 1902 etc. - Appointment of Justices; The Magistrate & Jurisdiction; Duties; Credibility of witnesses; Production of Eviidence; Witnesses.